Moscow's oldest and most famous theatre, the Bolshoi, dates from 1824 and is home to world-renowned opera and ballet companies. Completely rebuilt after a fire in 1856, the grand building is a masterpiece of Russian neoclassicism, including an eight-columned entrance porch topped by the horse-drawn chariot of Apollo, patron of the arts. The glittering five-tiered interior is richly adorned with red velvet furnishings, ornate gold detailing and chandeliers, and the size of the auditorium makes it one of the largest theatres in the world. 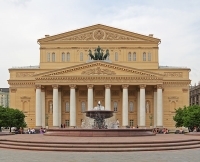 The Bolshoi Theatre has hosted some of the world's most celebrated premieres, including Swan Lake, Spartacus, and concerts by Richard Wagner, - attending an evening performance at the Bolshoi Opera and Ballet Theatre constitutes one of Moscow's best nights out. Address: Theatre Square, 1, Moskva, Russia. Admission: Ticket prices for performances vary.